Macedon, N.Y. - Smile! The theme for the 2018 Amazing Maize Maze celebrates not only the 25th anniversary of Long Acre Farms but the 130th anniversary of the Kodak Camera. During it’s summer preview weekend on August 25th and 26th guests will be asked to smile and capture a memory when they exit maze. 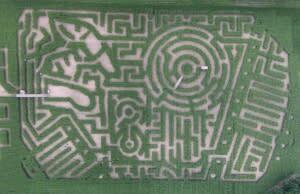 The Amazing Maize Maze will be open on August 25th and 26th for a sneak peek from 10am – 4pm and then will not re-open until Sept 15th. “The corn is in great shape this year,” adds Joan Allen, “so if you really want a good challenge, August is the best time to try if before the corn begins to dry down.” Admission tickets are $12 and include Amazing Maize Maze, Animal Track Maze, Back 40 and Mini Jump Pad. For every ticket purchased guests will receive a free Bounce-back return ticket to be used in the fall. For more information, directions and a calendar of events visit www.longacrefarms.com or call (315)986-4202.